TripAdvisor has named Luskentyre Beach as one of UK's best beaches. Visitors remark that it feels like a Caribbean beach with its golden sands, clear as crystal water. 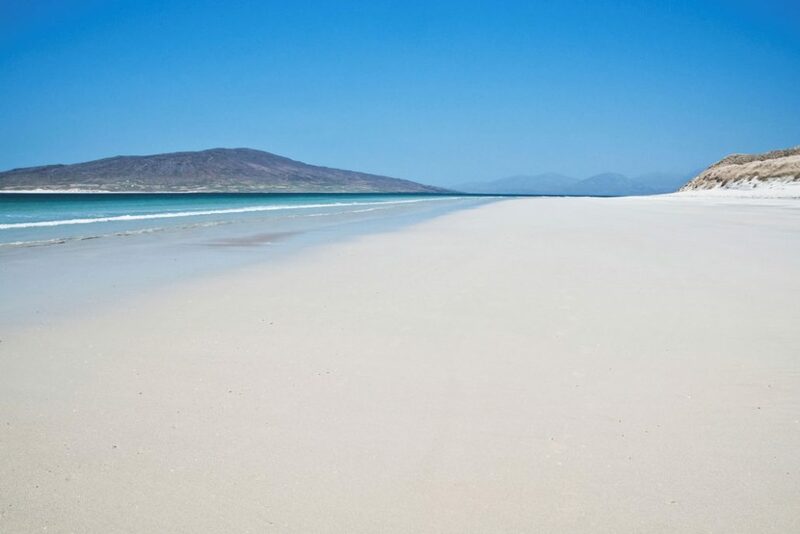 This beach is located on the Isle of Harris, Outer Hebrides and therefore the waters will feel cool to your toes. The Hebrides is an archipelago in the north west of the UK and west of Scotland. These are divided into the inner Hebrides, closer to the mainland and the outer Hebrides which are further away. The Hebrides as a whole are remote and sparsely populated, mostly be fishing communities. Today, places like Skye (Inner Hebrides) are primarily a tourist destination. The isle of Harris is known for its spectacular yet desolate landscape providing a peaceful retreat. There's amazing amount of wildlife to watch - wild ponies, dolphins, otters, seals, eagles and more are all part of this beautiful landscape. The way to reach Harris is to take a car ferry service from Skye (Uig﻿) that gets you to Tarbert. From Tarbert, Luskentyre is about 10 miles away. ​If you aren't driving from your destination in the UK, the best thing to do is to get to Glasgow or Edinburgh and hire a care. Then drive to Skye, which is a scenic route through the remote and desolate parts of Scotland and catch the ferry. Flybe has a service from Glasgow to Stornoway on the northern tip of this island. Get to Losgaintir by hiring a car and the journey is over an hour. Self catering £350-800 for a week and can sleep 5. Self ﻿catering £750-1200 upwards for upto 6 adults for a week. B&B from £240 a night. They also have a self catering option. Skye- neighbouring inner Hebrides island and visit the Cuillin mountain range & the Talisker distillery for the whisky loving adults. With a small local population, the Hebridean islands have few convenience stores and no fast food chains. So if you are from the cities, this can be quite a change! Plan to enjoy local restaurants or buy groceries from local convenience stores. The price of the remoteness of these islands is that you may find that meals, accommodation ​are expensive particularly in the peak tourist season.